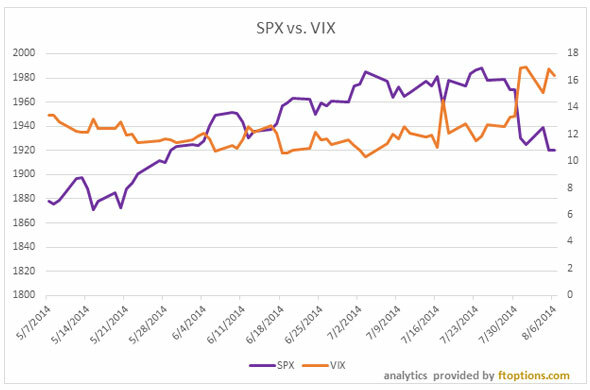 Investors are de-risking everywhere, setting the VIX up for a pop above 20. NEW YORK (TheStreet) -- With the VIX "fear index" still wallowing in the teens and the S&P 500 relentlessly making new highs, "complacency" has been the word most commonly thrown around this year to describe the stock market. But there are signs creeping in that the market has been anything but complacent in recent weeks. Trading volume has been light, with the August lull being just partly to blame, and Treasury yields have declined to 52-week lows. Yields pierced 2.4% late Thursday night, after President Obama announced plants to go forward with an air strike in Iraq. The 10-year note was surging 11/32, driving the yield to 2.375% Friday without much help from the Federal Reserve as it continues to taper its bond-buying program. The main reason volume has been so thin and Treasury yields are being pressured is investors have been de-risking from stocks and flowing out of junk bond funds and high-yield bond funds in search of safety. They want a place to hide right now. 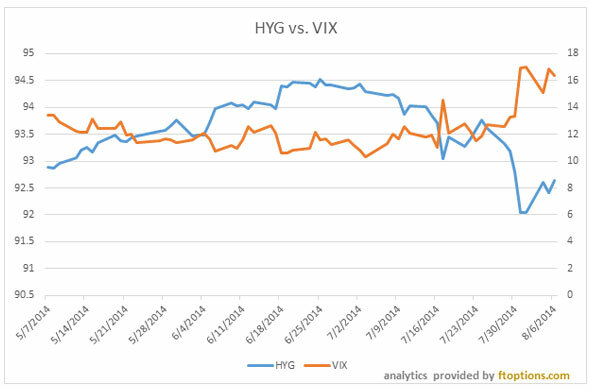 That correlation can be clearly seen in the chart above, which shows the inverse relationship of high-yield corporate bonds, tracked by the iShares iBoxx High-Yield Corporate Bond Fund (HYG - Get Report), vs. the VIX. The disruptive forces are bearing down from everywhere -- the friction between the West and Russia over Ukraine remains strong, with the Kremlin recently slapping one-year agricultural sanctions on Western nations. Tensions in Iraq have escalated to a point where rebels have seized the country's largest dam and the U.S. has begun limited bombing of militant targets to protect Americans and Iraqi citizens there. The Ebola scare and containment fears have led to flashbacks of the early 2000 SARS outbreaks and reminders of the bird flu. It seems reasonable that geopolitical tensions could get worse from here or just not improve for a very long time, especially as it pertains to Russia. Russian President Vladimir Putin's iron grip on his country and ability to steer it as he wishes on the world stage will continue to come at the expense of Western interests. "Putin can ride out the storm a lot longer than any other politician in the world," said Luke Rahbari, chief risk officer at Stutland Volatility Group and a veteran options trader. "He can keep going at this for a while." With the sanctions, Europe's economy has become even more vulnerable lately, and that impact could bleed into the U.S. economy and elsewhere. The flock to Treasuries is expected to intensify when the Fed abandons its role in driving the hunt for yield since 2008. There's still more room for Treasury yields to drop given that they have a way of sustaining their declines during heightened times of uncertainty. During the peak of the financial crisis for instance, yields on Treasuries briefly turned negative. The flight to safety can a have self-reinforcing effect driven by strong herd mentalities. The declining Treasury yields have strong implications for the VIX, as higher Treasury prices have historically had as strong a positive correlation with the VIX as the VIX has had an inverse correlation with the S&P 500. The chart above measures the iShares Barclays 20+ Yr Treas. 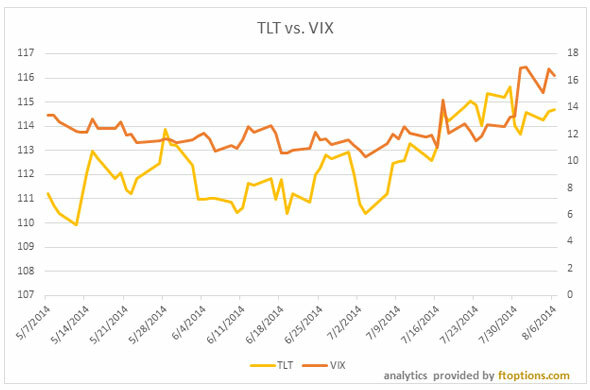 Bond ETF (TLT - Get Report) compared to the VIX. Rahbari says that that the VIX could spike above 20 in the coming weeks if geopolitical pressures maintain or strengthen. The VIX has jumped to 17 from 10, where it was on July 3. Though it's still below 20, that's still an enormous jump, climbing 70% in a little more than a month, which presents a preview of what could come in the intermediate term. "All this nervousness, if you put it all together in sandwich, is not anything that any long investor wants to take a bite of right now," said Rahbari. Despite the tendency for the VIX to revert to its historical mean and the potential for a reprieve from any one of the geopolitical concerns, Rahbari said that the bad news in aggregate will be keeping the VIX from spiking down as hard as it could spike up. Joe Bell, senior equity analyst at Schaeffer's Investment Research, is more conservative with his VIX predictions, referencing a possible drift lower after last week's bounce. However, the analyst is reluctant to provide any specific numbers until he can get a strong confirmation of market signals. "Historically, when you see these sharp moves in one direction [like last Thursday], over the short term, it generally mean reverts," said Bell. "But that's not a fact. There are times when it spiked and continued to spike a few weeks later." If VIX hits above 20 in the coming weeks, the big momentum names could suffer the biggest shock. Google (GOOG - Get Report), Apple (AAPL - Get Report), Priceline (PCLN, Chipotle (CMG - Get Report), Amazon (AMZN - Get Report), Tesla (TSLA and Netflix (NFLX - Get Report) would be key among them. Weaker stocks that have risen along with the rest of the market despite low earnings and market share may also finally get a correction. For stock investors who would prefer to buy some insurance over taking money off the table in the coming weeks, options analysts recommend they purchase VIX options protection sooner rather than later, before premiums really spike.